The Schlage Saturn AL-Series commercial keyed and non-keyed door lever locks utilize the Schlage original A-Series cylindrical chassis with stylish lever designs supported by heavy duty spring cages. This design provides strength and performance in the more abrasive commercial Grade 2 applications. The Saturn AL-Series is non-handed and is available in a wide variety of keyed and non keyed functions. Keying: 6 pin tumbler with two nickel silver keys per lock. Stock locks are keyed 5 pin. Other keying options available from factory include masterkeying, grandmasterkeying, construction keying, and interchangeable core. Also available with Primus high security cylinders. Applications: Standard duty commercial exterior and interior doors for medical, office, hotel/motel, public buildings, religious, multi-family, retail/storefront, government facilities and heavy duty residential. Entrance Lock - Turn/push-button locking; pushing and turning button locks outside lever, requiring use of key until button is manually unlocked. Push-button locking; pushing button locks outside lever until unlocked by key or by turning inside lever. NOTE: 2-3/4in. 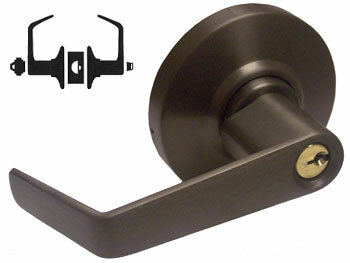 (70mm) mortise latch standard. Please specify in the Comment section of the order form if you require a 2-3/8in. (60mm) backset latch. UL listed for all functions up to 3-hour doors.